A bomb blast killed at least 25 people on Sunday morning during Mass at Cairo’s Coptic cathedral complex, one of the most symbolic religious sites for Egypt’s Copts. The explosion ripped through St Peter’s Church, wounding at least another 49 people. St Peter’s Church is beside St Mark’s Cathedral, which is the headquarters of Egypt’s Coptic Orthodox Church and is home to its spiritual leader, Pope Tawadros II. The bomb exploded in a section of the church designated for female worshipers, and hit shortly after the 200-strong congregation had listened to the readings and the priest was about to give his sermon. “I found bodies, many of them women, lying on the pews”, reported a cathedral worker who rushed to the chapel after he heard the blast; “it was a horrible scene”. President Abdel Fattah el-Sisi described the bombing as a “terrorist act” that has no place in Egypt, and declared a three day period of national mourning. 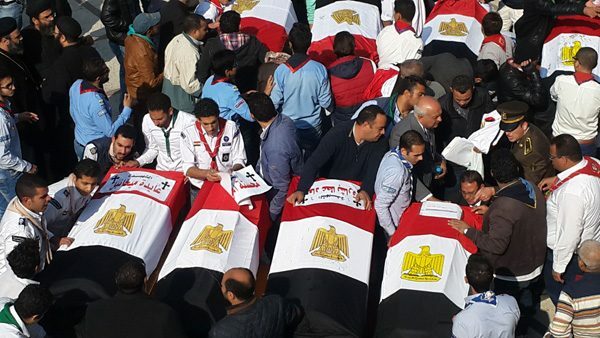 Senior Egyptian officials, including the prime minister and interior minister, visited the church shortly after the attack and were greeted by angry protesters who complained about the continual attacks on Christians, as well as the failure of security forces to stop attacks. The Grand Mufti, the highest official of religious law in Egypt, condemned the “deplorable terrorist attack”. “attacking churches whether by demolition, bombing, killing those inside, or terrifying people is prohibited in Islamic Sharia”. He called for unity against “terrorism that tries to instigate sectarianism and sedition among the two wings of Egypt – Muslims and Christians – in a bid to weaken the nation”. There was no immediate claim of responsibility for the bombing but suspicion immediately fell on Islamic extremists, who have staged numerous attacks across the country this year targeting the minority Christian Copt community. The community, which makes up 10 per cent of the population, has long felt discriminated against. Attacks on Christians have intensified since the 2011 populist revolt that ousted President Hosni Mubarak. At least 26 sectarian assaults have targeted Christians this year alone.